I have had a very, shall we say, rocky relationship with the woman who was my step-mother for about 30 years. She came into my life when I was around five and a half, not long after my parents separated. She moved in with us (my father retained custody of me) and I think things were OK, for a little while at least. As time went on, she was pretty hard on me, even though I was a very good kid, by all accounts. She expected me to love and appreciate her automatically, pushing her boundaries as my dad's girlfriend (and eventually wife) to the point of trying to take my mother's place. This was a sore spot for her, but it wasn't our only problem. It was certainly no reason to treat me the way she often did. I tried to make my way with her for SO LONG. I tried so hard with that woman for the sake of my relationship with my father, to the point where I made every concession and every apology I could stomach over the years. It eventually took its toll -- when I just couldn't handle her disappointment in me AGAIN -- leading us to not speak for a few years. Then my father's relationship with her crumbled as well. Thankfullly, he and I slowly found our way back to each other. My relationship with him now is the best it's been since I was little. He and I have talked a pretty good amount about everything and I think we understand each other, for the most part. Recently, though, my former step-mother has begun pushing boundaries again. I can't -- and won't -- do it anymore. Below is a letter I just wrote to her. It's completely honest, blunt and maybe a bit harsh on my part. But I had to do it. I am sharing (a slightly edited version of) it because this tumultuous relationship has been very influential in my life, causing a handful of the personal issues I've had to work through as an adult. It is part of my journey, part of my story, and I want to own that. I am really hesitating, though, for fear that I will be misunderstood as unforgiving or selfish...or something. Truly, I am neither. I need to tell you, for the second time: I don’t want to have a relationship with you anymore. Furthermore, I do not want you to keep referring to yourself as “Grandma” to my kids. First, in regards to my kids because they are most important to me. It is confusing at best, and manipulative at worst, for you to send them gifts and sign the cards “Love, Grandma” when you are NOT a grandma to them. You were Camryn’s grandma for awhile, but when you got angry at me and simply refused to talk to me about it for THREE YEARS and just walked out of our lives, you gave up the privilege of being her grandma. As for AJ, you never came around when he was born, didn’t even meet him until he was almost 2, and he doesn’t remember you. You were NEVER his grandma. Now, I am not going to begrudge my children being thought of for Christmas or their birthdays by anyone, so I’m not telling you you cannot send them gifts if you continue to feel the need. However, do NOT sign the cards “Grandma”. Referring to yourself as their grandmother is confusing to them, and it’s just plain not true. See, you burned that bridge, like I said, when you walked out of our lives years ago over feeling slighted by me. You did this. I wanted you to be my kids’ grandmother from the beginning. I wanted that for you and for them. But not only did you turn your back on us, you are now separated from my father. Your divorce will eventually be final and we will no longer have any familial or legal connection. So I am drawing a line at “Grandma”. It is a boundary I am setting and I expect you to respect it. I am their mom and it is my job to protect their hearts for as long as I can. And yes, I do feel they need protecting from you. I needed protecting from you and the awful things that came out of your mouth when I was a kid. I don’t think you have any idea the depth of hurts you have given me in my life. You can say you love me til you’re blue in the face and I will not believe it. I don’t feel that you ever really loved me. Not unconditionally, anyway. You made me feel, from the tender age of five on, that I wasn’t good enough. I have never been good enough for you. So now I’m telling you, you’re not good enough for me. There’s just been way too much hurt between us so why on earth would I care to continue the charade? For the life of me, I cannot understand why my father is willing to communicate with you after all that you took from him. I hope you are very grateful for that. 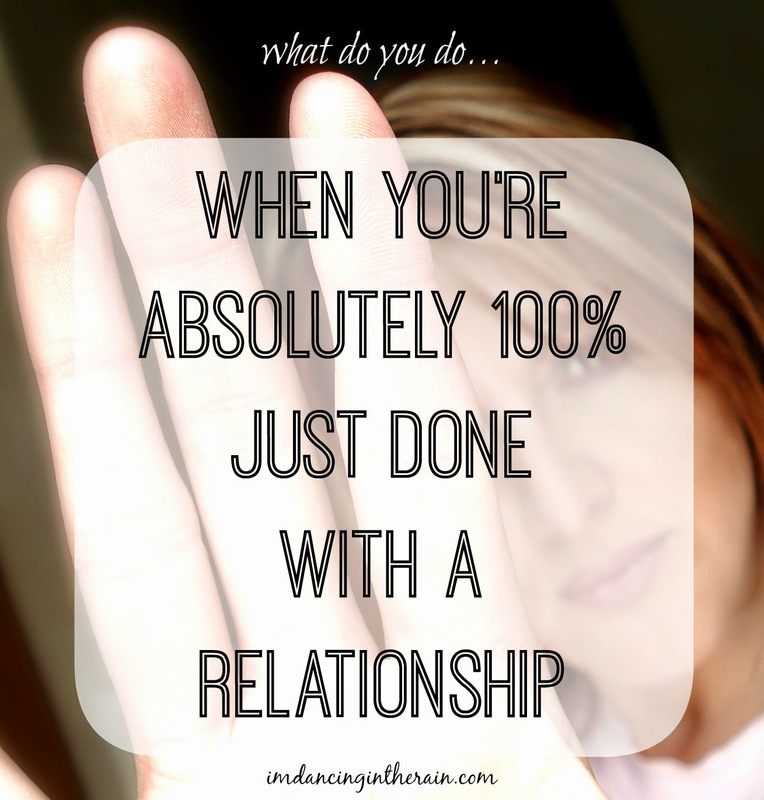 Please hear me: You are no longer a relationship I need to work on in my life. I do not have the time or energy for anyone I can’t trust, and I do not trust you. So, you and me? Not happening. At all. You and my kids? OK, if you really feel the need, but you are NOT their grandma. Do you understand? I have been trying to set boundaries with you my entire life. Nobody understood my feelings then and I doubt you’ll understand my feelings now. But you need to BACK OFF. I mean….I cannot believe you called my mother and tried to commiserate with her over my dad! Seriously? Boundaries. You don’t seem to have any and I’m not putting up with it anymore. I am a 40 year old woman now with a family and lots of complicated life issues to deal with. I don’t need to worry about your drama and inability to LET GO. Another boundary I’ve set is not letting you call me. When you called me twice on my wedding anniversary, I added your number to my reject list. Hearing your voicemail…that you think about us often and hope Mark is OK….thought maybe we could “chit-chat”….No. I cannot be fake with you anymore. My reserves of pretending just to make someone feel better are tapped out. Besides, you don’t want to talk with me for any other reason than to make YOURSELF feel better. It’s always been all about YOU. I’m sorry I’m so angry. I really am. I wish I wasn’t. That is something I eventually need to let go of. I will need to let go of my anger for MYSELF. Whenever I do, it still won’t mean I want you in my life. You gave up on, and ruined any possibility of, us being one big happy family. That ship has more than sailed. And I am more than DONE. Please, please respect what I’ve said here and honor my wishes. Anyone who reads me regularly should know that I'm not usually so repetitive. In this case, I feel I have to be because I just know she doesn't want to HEAR me. I fear she never will. And I really am sorry about how much my words will probably hurt her. I never want to hurt someone. I just don't know what else to do at this point. Because I'm done. I have no more energy for this. It could have been worse. I could've yelled and screamed and told her outright to F*CK OFF. I didn't go that far, so I guess there's that. Sharing with Pour Your Heart Out.